What are the 2018 Jaguar XF Exterior Features? The 2018 Jaguar XF brings a lot of style to the Washington DC area thanks to its detailed and dominating exterior. After all, this model sticks to the Jaguar reputation with its exterior design. With features like incredible headlights that deliver crispness to the road down to the right wheels that offer incredible traction throughout Baltimore, you’ll certainly love having other drivers’ heads turn as you pass them by in the new Jaguar XF model. The 2018 Jaguar XF comes equipped with 18-inch alloy wheels, offering you the traction to seamlessly handle the roads in Arnold and surrounding areas. The 2018 Jaguar XF is a great choice for drivers interested in an exterior that brings style and versatility to the forefront. After all, Jaguar knows how to impress drivers, and it hasn’t stopped yet. 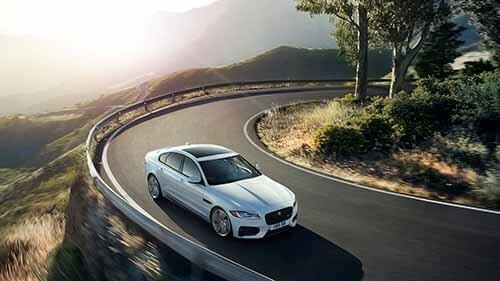 When you’re interested in learning more about the 2018 Jaguar XF, visit Jaguar Annapolis, located at 101 Ferguson Road in Annapolis, MD, to see our vehicle inventory or take a test drive of the new model. You can also contact us at (410) 904-3107 to learn more about our current specials.